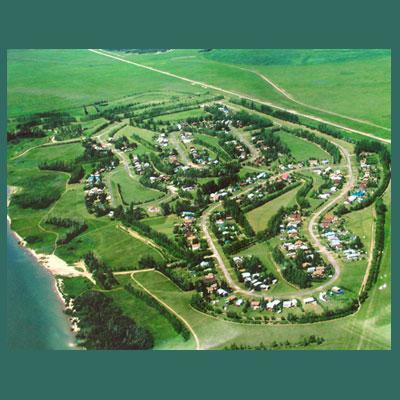 Mistusinne from the air: cottage crescents set among tree-lined green spaces, beside the lake. Mistaseni was the Cree name given to 400-ton granite boulder deposited thousands of years ago at a location ten miles southeast of the current village of Elbow. Cree legend had it that the rock was once a buffalo dropped on the site by a giant eagle. Captain Palliser first recorded Indian ceremonies at the rock in 1857. Old timers recall finding beads and bits of cloth tucked into the rock’s crevices as ceremonial offerings. After unsuccessful efforts by archaeologists and entertainers to raise enough money to move the rock, in December 1966, PFRA engineers drilled holes in the boulder for 60 sticks of dynamite and blasted it apart. The legend of the rock lives in the memory of Indians like Pat Cappo of the Muscowpetung First Nation who recalled his grandfather’s band of 600 wintering near the rock in 1868, “the year they took peace with Sitting Bull”, and also in its namesake, the Resort Village of Mistusinne.